The DIY fabric kid’s fabric play mat is super oversized (16″ x 28″) to give lots of playing room. It’s machine washable, hang dry. Make this one for your kids. 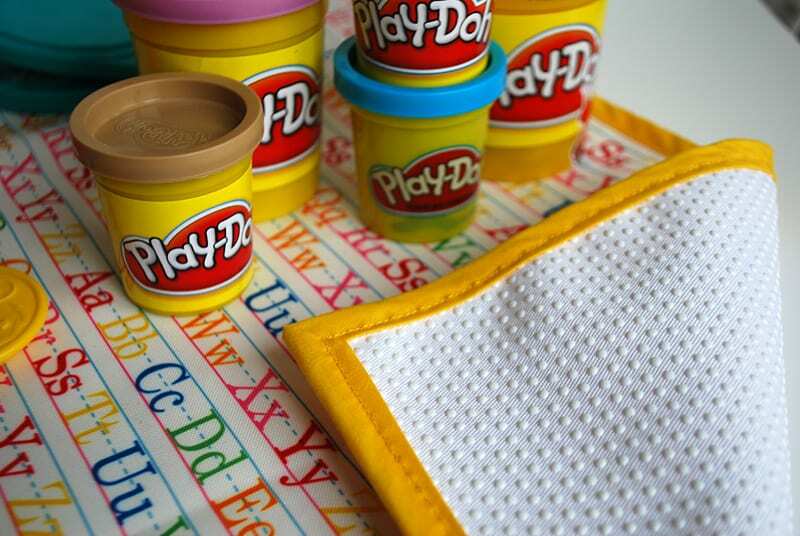 No more play-doh or crayon marks on your table! Take a look at this Padded Baby Play Mat FREE Tutorial, too! Hi Linda, I don’t think there’s an actual pattern for this one but rather just instructions because the fabric is just a rectangle. Your link for the oil canvas doesn’t go to the alphabet one and I did a search and can’t find oil canvas fabric anywhere. I’d love to make one of these for my 3 yr old grandson. Hope you can help me find it. Thank you. Hi April, I’m struggling to find that fabric too. Maybe someone else can find it and leave a link?